The Range Regional Airport has seen a large increase of passengers who drive/park at the airport over the past few years and expects this trend to remain. With this increase in volume, the terminal parking lot has extremely limited space for passengers to park during times of high traffic and chartered flights. The current terminal parking lot has a capacity of approximately 220-240 parking spaces depending on compliance with the painted spaces during snow events. During the high traffic time in October of 2017 there were around 250+ cars attempting to park for an extended period of time, several of which were forced to park in the grass along the access road. 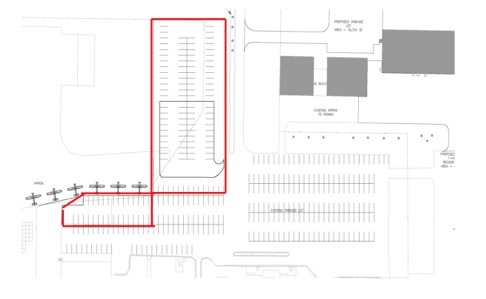 The proposed expansion and rehabilitation of the terminal parking lot would provide approximately an additional 125 parking spaces for travelers expecting to park and leave their car for an extended duration. The existing 18,200 square yard parking lot and entrance road has severe bituminous cracking and heaving making it difficult to maintain and plow during winter months. A full depth reclamation of the existing bituminous pavement is proposed to provide additional strength to the parking lot and entrance road to ensure a long-lasting, durable rehabilitation. To optimize parking alignment, the existing light poles will be relocated and upgraded to provide adequate lighting of the lot. The proposed expansion would include approximately 5,600 square yards of new parking surface and a widened access road for ease of snow removal and rehabilitation phasing. To accommodate the additional parking areas, the existing security fence and gates will need to be removed and replaced. This parking lot expansion will ensure that the Range Regional Airport has the ability to provide paved parking for all of its passengers for the foreseeable future. Due to the availability of federal funding the project will be bid it two separate projects and spread over two federal fiscal years. In 2018 the entire project will be designed. Phase 1 construction and bidding will consist of the parking lot expansion. Phase 2 which will occur in 2019 will consist of a major rehabilitation of the existing parking lot. The project is estimated at $1.9 million and Federal Aviation Funding (90%) and MNDOT Aeronautics funding (5%) and Chisholm-Hibbing Airport Authority funding (5%) is anticipated.